Rain falls down plunking off my tent roof as I lay awake on the last night of our five day ride down and back up the Blue Ridge Parkway from Virginia. It seems fitting since that it’s raining at the end of the trip since that’s how the trip started. Not to mention the rain that we had during the trip. Even so, it’s been a memorable and fun adventure. On September 21st Ron, Paul, Brian and myself started out at 8:30 am from Warrenton, Va to pick up our fifth member, Carlos, in Madison, VA. at the Pig and Steak. From there we were set to ride about 330 miles to our camp for the night. Our route took us down Rt. 29 to Waynesboro, VA where we picked up the BRPW. At Roanoke we exited the Parkway on Rt. 221 to Rt. 58 to Grayson Highlands State Park. The riding was good. The weather was pretty bleak. Most of the trip on this first day was under heavy cloud cover with occasional rain. At the start of trip like this though you have to try hard not to have a good time. Arriving at Grayson Highlands State Park we setup our tents, stretched out the large tarp over the picnic table and started a fire just in time for another rain storm. The tarp was a employed many times during the trip as a rain shelter. This time the rain was short lived. The fire stayed strong thanks to coals provided by the camp host, a friendly and lively older man in a USMC hat and faded field jacket. He checked in on us again after the rain to make sure that the “green horns” (he made sure to tell us) where still OK and had a fire to keep us warm. After the short rain storm we set about to cooking dinner for the night: brats, peppers and onions, and corn on the cob. 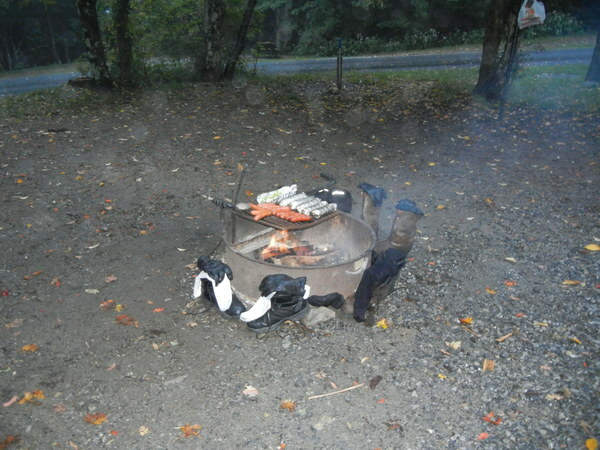 After dinner the group took advantage of the lack of rain and the fire to dry out boots, gloves and socks to varying degrees of success. An inspection of the nights efforts in the morning found several melted boot soles and a chard sock that had been sacrificed to the fire in hopes of appeasing the rain gods to keep the rain at bay. It seems to have worked, but most agreed that they would need new footwear when they got home. Day two of the trip found us winding our way back south following Routes 88 / 105 / 194 / 19 / 197 through Pisgah National Forest and then picking up the BRPW at Bee Tree Gap just north of Ashville, NC. From there we rode the Parkway to Cherokee, NC the southern end of the Blue Ridge Parkway. The Parkway on this stretch is, in my opinion, the most beautiful and fun section of the 469 mile road. In NC the parkway swoops up high into mountain passes with elevations ranging rom 4,000 to 6,053 ft, the highest elevation on the BRPW. Tight switchbacks and long sweeping corners with stunning views of valleys and mountain tops made it hard to pick a speed. Take the corners fast and the sweepers slow so you can enjoy the view and you get the best of both worlds. Somewhere along the way, at one of the scenic pull-offs that line the parkway, stunned by the view into the valley below, Carlos not only left all his cares behind but his cell phone too. He noticed about an hour later at the next stop and he made a run back to the where he thought it might be.He said he’d catch up with us at the camp site that night. He arrived about an hour behind, phoneless and disappointed, but at least we had dinner ready. This was the first hiccup in the trip but not the last. A quick call to his carrier and he had a phone waiting for him at home when he got back from the trip. We stopped in Cherokee (minus Carlos) and picked up provisions for the night. A short 20 mile trip west to Turkey Creek Campground and we were ready to setup camp, cook dinner and take a much needed shower. Dinner was steaks, potatoes, and green beans cooked over the campfire. You really can’t beat a good day of riding (more riding for some than others) followed by a steak and a hot shower. I know I slept well, full and happy. 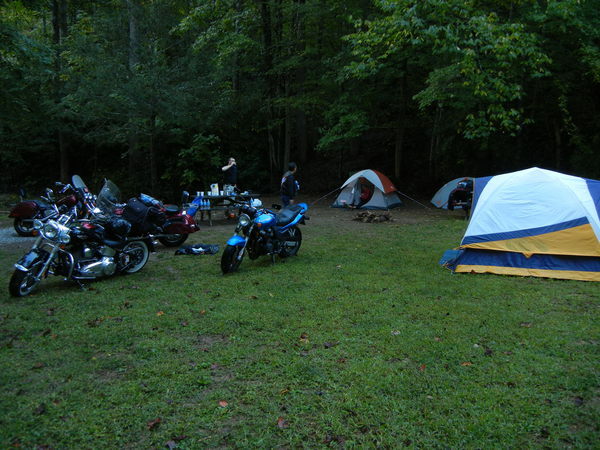 I drifted off to visions of the next days adventure to the Tail of the Dragon and the tap tap of rain drops on my tent roof. Day three and it was off to the Tail. This was a trip we’d plan to make last year but the weather and Ron’s dead battery conspired against us and we had to skip it. This year we had mostly clear skies and all the bikes started up without a hitch. After a breakfast of eggs and bacon prepared by Paul we packed up and headed out for the famed Tail of the Dragon. If you’re not familiar the “Tail” this is a short section of US 129 in NC with 318 turns packed into just 11 miles of road. 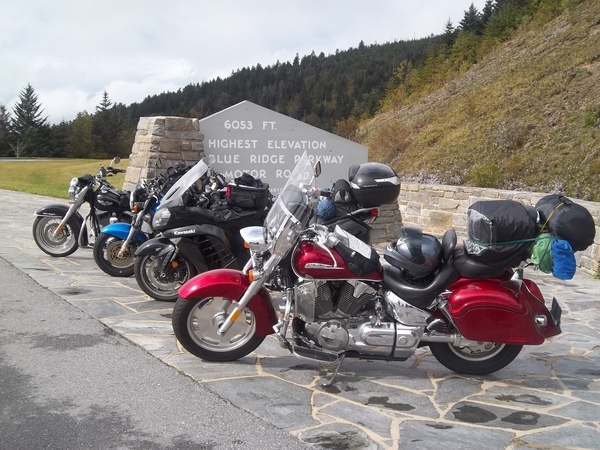 Deals Gap has become a destination for motorcyclists and like the BRPW has made it’s way onto a number of must-ride-before-I-die lists kept in tank bags or nailed to shop walls all over the country. I have to admit that I was a little nervous. If it hadn’t been for some instruction over the previous few days given to me by fellow rider on this trip and former motorcycle racer Paul, I don’t think that I would have enjoyed it nearly as much. As it was, I attacked the Dragon with as much gusto as I and my fully loaded Connie could muster. When we reached the end I was surprised at two things 1) that I had so much fun on such a short road and 2) that I mostly kept up with Paul (who I’m sure was taking it easy). 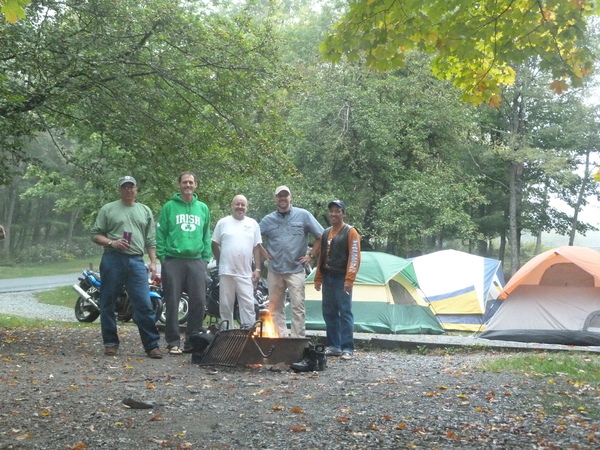 After regrouping at the end of Dragon we turned up into The Great Smokey Mtn National Park on our way back to Cherokee. There we’d pick the parkway back up and ride to Crabtree Meadow Campgrounds. That was the plan anyway. 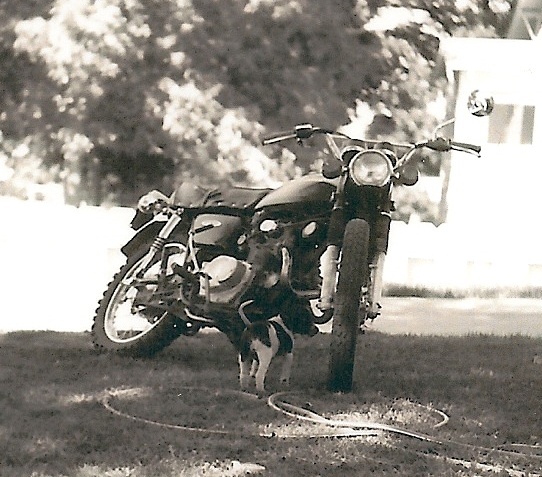 As they are want to do on a motorcycle trip things don’t always go as planned. A few miles outside of Gatlinburg, TN. Brian started to feel his back end get a little wiggly. Turned out his rear tire was loosing air pretty fast. No problem, several of us had patch kits, as good travelers should. No luck. 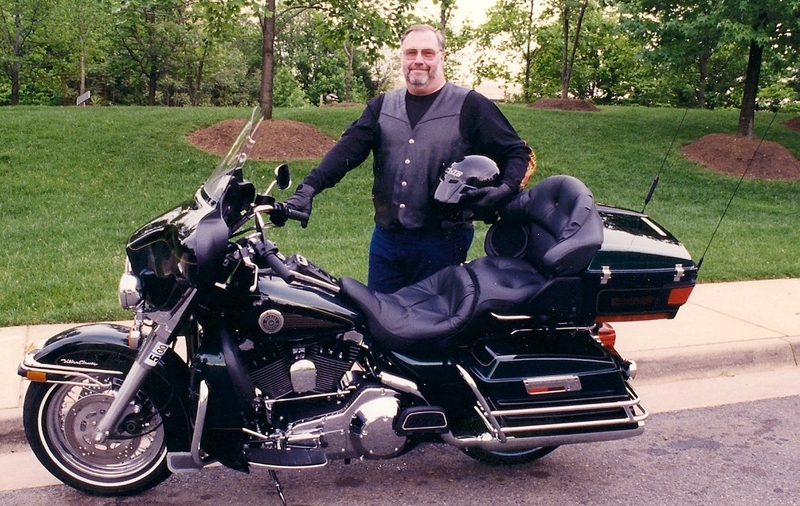 Brian was riding a later model Harley with spoke wheels and tube tires (really?!?!). So we pumped in two cans of fix-a-flat, turned on the emergency blinkers, and headed into town. A few stops to get directions and we found a chopper shop that was more than willing to fix the tire. We all decided, with Brian’s blessing, to head back to Cherokee, grab some food, and get back on the BRPW so we could get camp setup and dinner started before dark. 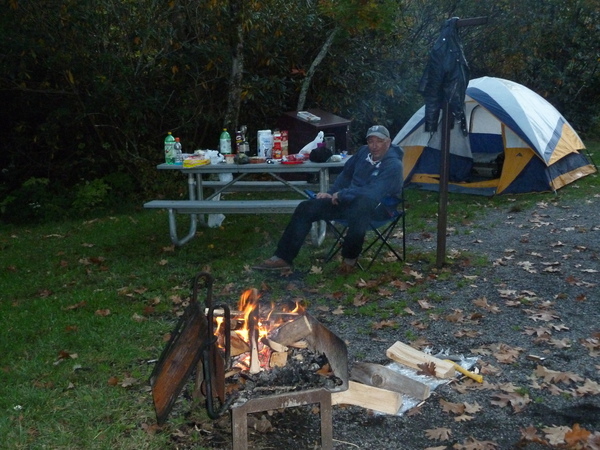 We made camp at Mount Pisgah Campground right off the BRPW in time to get the tents setup and get dinner cooking before dark. Chow was chicken fajitas, peppers and onions, salsa, shredded cheese, lettuce and macaroni salad. Always good eats on the road. The camp ground was at an elevation of about 5,000 ft so it was by far the coolest night we had. No rain and a big fire made it a wonderful night. Brian made it to camp about an hour behind us. The culprit was a roofing nail he’d pick up somewhere on the route. He has plans to mount it on top of his helmet (ala Kaiser Wilhelm helmet). Packing up dry gear for the first time on the trip was a nice change. Day four put us back on the BRPW to just outside of Roanoke, VA. From there we broke off to Smith Mountain Lake for the last night of camping. The ride on this section of the parkway is filled with sweeping turns through tree lined tunnels that open to large fields separated by split rail fencing. The scenery really brings you back to when this area was frontier country. It’s easy to get lost in thoughts of log cabins and farmsteads as you ride by. Coming down out of the mountains also brought us closer to the wildlife. Deer, wild turkeys and what Ron described as a “jumping squirrel” (rabbit? ), came out to greet us but staid, for the most part, off the road. 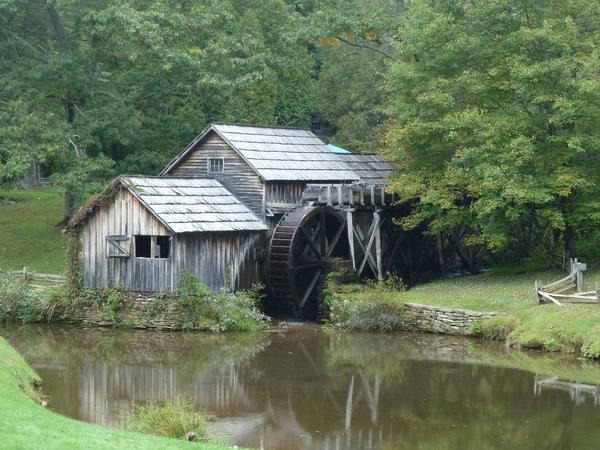 A notable stop on this section of the Parkway is Mabry Mill. There’s a quaint restaurant and the most photographed structure on the parkway, the Mabry Mill itself. We meet a really nice couple here on their Indian, complete with matching black and red Indian leather jackets and chaps. They where on their way down the Parkway the way we had come so we chatted a bit about the weather and road conditions they where going to run into then parted ways. The rest of the ride that day was in and out of fog with breaks of sunny and warm weather. 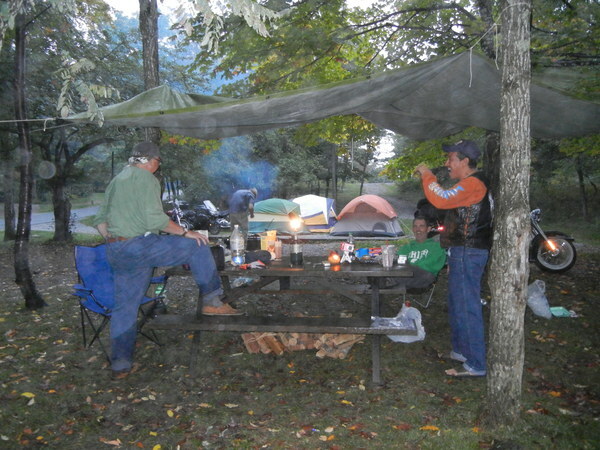 We arrived at Smith Mountain lake, setup camp and then rode to a restaurant we’d passed on the way into camp. Tired and a little warm after being in higher elevations for the past few days we opted not to cook out. The camp site was very clean and the showers where a blessing. We stayed up a late knowing that the next day was a shorter ride. We talked over the ride and several other topics as the fire burned down and the last of snacks where consumed. Day five was a run up to Waynesboro, VA where the beginning of the BRPW meets up with Skyline Drive. From there we broke off to Rt 29 and headed home. The day started out a little damp. Rain that night meant packing up wet gear again, but by then we were pretty used to it. Rain, fog and sporadic bursts of sunshine where the norm for the day until we got to Waynesboro. From there all the way home was a variation of light rain to heavy rain, mostly heavy rain. 94 miles of rain later I pulled into my garage and started striping off wet gear watching the water drip off my bike and form a puddle under the center stand. All in all the trip was about 1400 miles and five days of riding, eating, laughing, camping, and more riding. On more than one occasion we all commented on what a unique event it was. To be able to bring 5 people together (Paul for the first time) who made the commitment to a five day riding trip, but we were all happy and grateful that we set the time aside. With all of our business and family commitments we were very lucky to have this opportunity. On the last night as on the first we made a toast to our good fortune, good friends and to our families for allowing us this chance to have this adventure together.